I dare you to search for a hotel in Google. 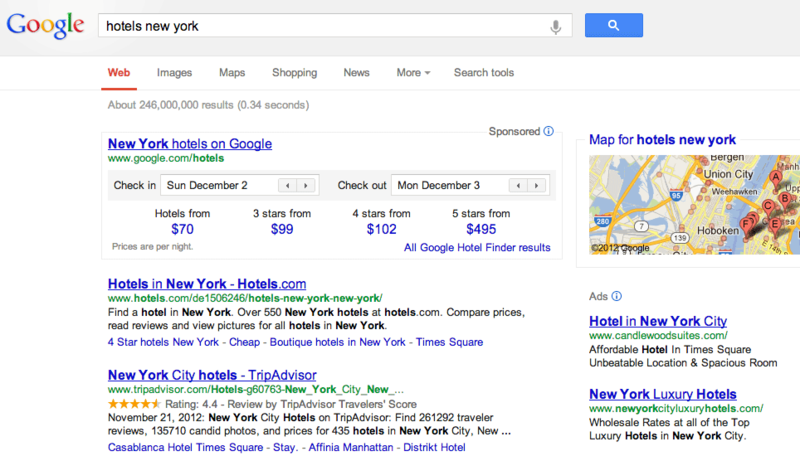 Try searching for [hotels new york] or [seattle hotels] or [hotels in tel aviv] and I challenge you to not find a Google Hotel Finder "sponsored" listing right below the Google AdWords ads and right above the Google organic search results. There is a screen shot of me removing the 2 or 3 AdWords ads, just so I can clean up space here on this post. Note, you can click on the image to enlarge. These started popping up in the Google search results last December but recently they have been coming up more and more often - virtually for all hotel travel based searches. A WebmasterWorld thread has many SEOs and Webmasters not happy. Of course, those who are in the hotel aggregation business are not happy. But some searchers are not happy also. My travel plans are too critical for me to trust them to sites that try to survive through SEO alone. Maybe I just know too much about the space. Travel is a space where I really want some kind of brand. 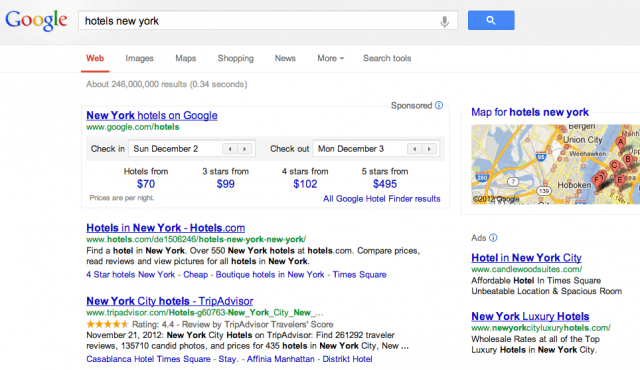 I currently agree, I cannot see myself booking a hotel room with Google. But I can see that changing - if Google keeps pushing it.